We listed up our recommendations for you ! MonotaRO offers Diamond files and more. You can buy them anytime from our Vietnam online store. Overall Length (mm): 170, 170, File Length (mm): 50, 50, Purpose: For groove processing., For groove processing. Length (mm): 50, 50, Purpose: Chamfering, surface finishing, and thermal spraying of stone, glass, and ceramics., Chamfering, surface finishing, and thermal spraying of stone, glass, and ceramics. See more results of "Diamond files"
Our choice for you, Diamond File Set and Diamond File Set 215mm. Best Hit Diamond File S type and Diamond File Set ! 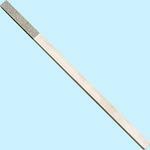 Replacement Core for Diamond Pen and Glass Cutting Tip Diamonds and other MonotaRO's offers ! Check our craftwork rim (diamond cutter) and Thin-Shaped Diamond Cutter here as well ! Diamond Cutting Blade and Glass Cutting Tip Diamonds and other recommendations. Diamond Cup Grinding Wheel and ”Dry Cup” and many other offers. Pen Glass Cut and Tip Diamond and many other best selling products. Check our Diamond Paste and WITH diamond paste here as well ! Our recommendation, Diamond Drill Bit and Positioning Guide.